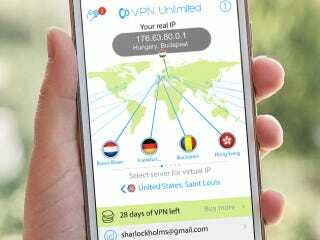 By routing your browser traffic via servers around the world, VPN Unlimited makes it impossible for anyone to track you. It also offers access to geo-restricted content, which is great if you want to stream videos or access blocked sites when abroad. As the name suggests, there are no limits on bandwidth, and the connection is fast and unrestricted. This license covers up to five OS X, Windows, Linux, Android and iOS devices (see compatibility here). Best of all, it’s good for life so you won’t have to worry about renewing your subscription. Interested? Head to the link below for more details.